The first day of school is quickly approaching. Is your tot stocked up on supplies and ready to go? We’re here to help! We scored some amazing eco-friendly back-to-school supplies and now we’re giving $270 worth of swag away to three lucky winners. 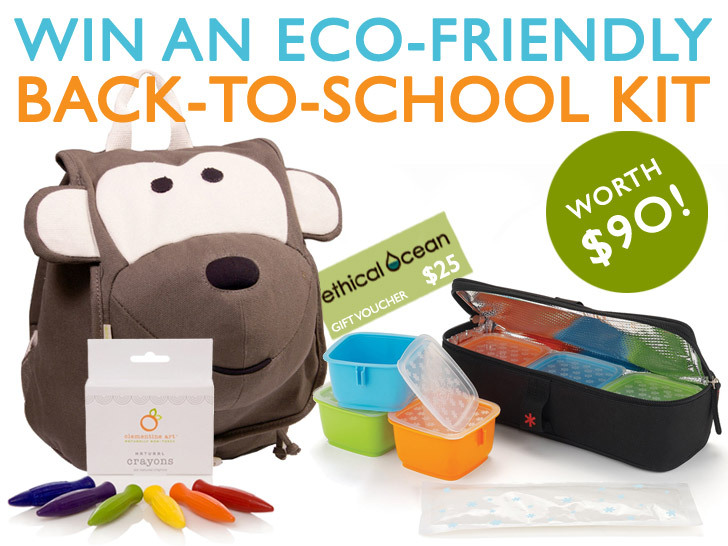 Each $90 back-to-school prize package includes a monkey Ecozoo backpack from Ecogear, a BPA- and phthalate-free Skip Hop Bento Mealtime Kit, a set of Clementine Art Natural Soy Crayons, and a $25 gift certificate to shop Ethical Ocean’s amazing selection of eco-friendly back-to-school supplies and gear. Read on to find out how to win one of the three kits, and in the meantime, you can use promo code ‘BackToSchool’ to get 10% off your green school supply order from Ethical Ocean through September 13! You’ll find everything from recycled pencils and notebooks to Fair Trade soccer balls and waste-free lunch kits – check out our favorites in our list of must-have green school supplies. Here’s how to enter to win an eco-friendly back-to-school kit worth $90! You have 3 chances to win! 1) Sign up for our weekly newsletter (with your real name). We’ll be notifying the winners in our newsletter – so you need to sign up and receive our newsletter to find out if you have won. *Note: we need your real name in addition to an email address! 3) Add a comment to this post with your answer to the following question: What back to school item do you always seem to buy new for your kid year after year? (extra points for creative answers!) Please be patient – comments don’t appear instantly because they must be approved. Contest ends Wednesday, August 31st, 2011 at 12 midnight EST. Open to US residents only. Winner will be announced in the following week’s newsletter! I have not figured out what they do with them but I always need to replace folders. NOw we homeschool so you would think I would be able to figure out what they do with them but every summer without fail not a single folder in the house?? boots and shoes because golly those little feet grow and grow. Every year I buy 3 new and important things: lip gloss with SPF (safe), scented travel-sized hand sanitizer (clean) and mini-note cards to send "mommy love notes" to school each day (loved). Backpack Even for myself growing up we all needed a new backpack. They always seem to need new pens and highlighters. We stock up on pencils and paper bought on clearance once every few years so that isn't needed at the last minute. After my older kids were past the themed backpack years they just reused their plain one so it made it easier. Now with a younger one the backpack will be back to new every year but now I know to donate the old one. We're an unschooling family of four kids with quite a wide array of interests - so new school supplies can range from pencils, paper, paints, and plasti-tak to piano music, pastry cutters, pliers, and petri dishes! But I must say what I seem to buy over and over are microscope slides. Favorite specimens all too often meet the tragic fate of being snapped in half by our resident 2 year old. Crayons! It's always the crayons! I feel like I am always buying backpacks! They get ruined each year. When I was a kid I kept mine for years at a time. I always make a trip to our local Japanese dollar store and get new supplies for bento box lunches and also pick up an assortment of small stationary so I can leave little notes in their lunches. I think it eases them a bit to see something written 'from home' especially in the first few weeks of school. And it's super cute!! School supplies bought every year... Crayons & pencils. For some reason, our 5 & 7 year olds break almost every crayon and pencil (multiple times!) by the end of the year. When they bring home their school supplies at the end of the year they have triple the amount of items in their pencil box due to breakage! My kids haven't reached school years yet but I know it will be school supply stuff like notebooks, pens, markers, etc. I'm a sucker for that stuff! This is the first year my kids will be going to school, so I can't quiet say what I'll be buying year after year. But I can only imagine that pencils, glue sticks and all the necessary school supplies will be a must to buy new each year. I was so excited to see all the great "green" school supplies that are available now- especially Smencils ( the pencils that are made from recycled newpapers that are scented)! I always seem to buy socks...and name labels. My kids are still in childcare, so we haven't had to buy the loads of school supplies, but we do get new name labels every year since we have to stick their name on everything that enters the center. For some reason we replace backpacks. I don't know what happens to them during the year, but they get trashed. I always feel as if I am buying crayons. Either they get lost, broken, or eaten by the baby sister at home! ;) Thus they need to constantly be replaced! I actually don't buy anything new unless something is broken or I sadly find out that a product I'm using is not safe :(. I still cannot believe that there are products that are unsafe for our children on the market. Thanks for hosting such a great giveaway! Lunch boxes. They always grow out of the one they have or it eventually gets lost conventiently half way through the year or so. Well, I'd have to say, the thing that's bought year after year is "cool" folders. They're so very destructible, and most kids, well, destroy such things very easily. Backpacks can last YEARS with a needle and thread as well as some unique patches to "update" them. Ice packs and back packs! Ice packs can only be frozen and thawed just so many times before they start leaking yucky blue stuff at the worst possible time! Back packs can only be crammed full of just so much stuff before they refuse to zip up anymore! I have to replace quite a few binders every year. They break like crazy. No matter what kind of binder it is even if its one of those cool rubber ones, they always get torn up. I buy my school supplies at the end of the previous year, through a PTA fundraiser. It's easier and it supports a good cause--a no brained! Our son is still a toddler, but we've purchased him a new small backpack the last two years, for preschool. I like Inhabitots on Facebook. Notebooks pens and shoes, I love new notebooks and pens and I feel like new shoes are a must for a first day of school! We always get a new lunch bag, because even when we wash the one from last yar it is pretty gross! New crayons, cool pencils and construction paper. Let the creativity flow! I subscribe via email and like on FB. I've had my Kleen Kanteen for years but for some reason, my kids beat their water bottles up so badly each year that I end up buying new ones. Back packs for sure! Their five star binders sometimes make it through a year relatively unscathed, but the poor back packs take a beating. Maybe rolling Samsonite luggage would resolve the issue? Remember the old commercial with the gorilla jumping up and down on the suitcase? It seems that every year I have to buy more and more tissues and hand sanitizer. If we could keep the kids home when they get sick maybe we could save a few trees and not have to constantly restock the classrooms with unnecessary items. Underwear!! I think it's a conspiracy to make us buy new characters for their booties!! I want to try iron on designs and tie dye this year!! Folders! Though I'm sure there will be other things that I learn along the way this is only the second school year that I will have kids in school! a backpack and oddly enough, new underwear. i associate a new beginning with new underwear. love this giveaway! I tend to have to purchase lunch related items for my daughter. Lunch boxes, water bottles, containers. Great giveaway. Every year I purchase a month-at-a-glance notebook style calendar. Not only do we record upcoming events at school and home. It sounds outdated (don't worry, I keep electronic calendars too), but it doubles as a short-form journal and scrapbook- we tape in event tickets, school photos, or even just pictures of what interests my little one at the time (these days, anything CARS). I still have mine from college, they are little treasures that don't take up much space in our little green home. Great giveaway. Every year I purchase a month-at-a-glance notebook style calendar. Not only do we record upcoming events at school and home~It sounds outdated (don't worry, I keep electronic calendars too)~ but it doubles as a short-form journal and scrapbook. We tape in event tickets, school photos, or even just pictures of what interests my little one at the time (these days, anything CARS). I still have mine from college, they are little treasures that don't take up much space in our little green home. I don't know yet. My oldest starts kindergarten this year and I'm dying! My little girl is big enough for school?? Not possible! Year after year, new things for the school year are clothes and erasers. Lunchboxes! We wear them out, or they get stinky, or lost... or just plain want a new look! I buy what each child requires to feel GOOD about going back to school. One son likes a new backpack and folders and the other prefers new novelty clothes. As a teacher, I know what most schools already supply and what might still be needed. However, for my chidren, I focus our going back to school experience on building a positive experience together. We always buy new and different eraser sets. They come in so many shapes and figures and themes that you have to try them out all year long! Signed up for the newsletter. Liked page on Facebook. We seem to need new shoes and pants every year, sometimes twice a year. Pants not due to growth, but with my boys, they seem to rip holes in the knees faster than I can patch them. Same thing with shoes. Holes in the toes. My boys are hard on clothes! Already a loving fan on facebook! I always buy a brand new lunch bag to get them excited about their lunch! They get to pick it out and they always look forward to it. Also, usually notebooks, and folders. Immune boosting vegan vitamins, vegan make up, hand sanitizer and a reusable canteen. I seem to buy more lunch box supplies each year because half of it gets throw away. I don't know how someone can NOT notice a reusable container as opposed to a baggie! Apples for the teacher, bookmarks for friends and lovely green pencils for the little one. We dont have to purchase anything new..other than pencils and we stick with Smencils for now..made out of old newspaper..
For back to school - slippers are a must. We homeschool and live in chilly New Englad. It is hard to study when you have cold piggies. My son hasn't started school yet, but he definitely needs diapers at daycare. We use gDiapers of course! We have not had to buy any new lunch bags, water bottles, or food containers since my children started preschool 3 years ago. The one thing I do buy new is a new sandwich cutter or cookie cutters to help decorate their lunches. I buy new apps for her to play while waiting in traffic so she doesn't fall asleep on the way home from school. I reload my Starbucks gc app on my iPhone so I have my coffee allowance. Another school year, kiss summer good-bye It goes so fast, how time does fly Back to school shopping once again It�s never too early to let the shopping begin Year after year, again without fail I search for a backpack, hopefully on sale It�s got to be perfect, the seams just can�t quit The last one we had, the whole side just split The straps wear out fast, the whole bottom is worn Who makes a backpack that just can�t be torn? I blame my son; it�s not a shot put They�re not made to toss, or kick with your foot! My daughter is starting Kindergarten this year and I'm still not sure what she'll need! But we did have to buy some new socks and shoes since her feet grew a whole size bigger during the past couple of months. I always need binders for school. This is my son's First year in school and frankly I am freaking out. But one thing I know I cannot have enough of are creative lunch ideas. He is not a picky eater, but likes to change it up, plus he is a veggie (like me) so I want him to be cool, but still be healthy. So wish me luck in finding cool, allergy friendly, earth friendly recipes :) Love the site!!! Envelopes � lots of envelopes! For Those special notes to teachers Those now and then sick notes Those requests for permission to leave school early The money for more fees The money for more contributions The money for donations The money for school funds The money for emergencies The money for lunch on the days we�ve run out of lunch stuff The money for school outings The extra forms that have to be completed throughout the year Surveys and Questionnaires to Parents Permission forms for school trips and school photos Parent Teacher meeting appointments School Insurance Forms Etc., etc., etc. My son is just about to start school.. we will likely be needing new clothes and shoes every school year.. until he outgrows his little boy urge to jump off from everything taller than himself and to slide on his knees .. apparently landing on feet is overrated in preschool! This fall is our first adventure into school-land with my son starting preschool next week. I think the one thing I'll be wishing I could by, year after year, is more time with my little ones to enjoy just a few more days of the sunshine of summer before each school year starts! That and shoes -- I'm sure we'll always need new shoes. Lunch boxes, shoes, clothes (uniforms), and backpacks always seem like the essential items we buy, then, since we are in Socal, there is the late-fall scramble for rain gear that we always for get to buy earlier for that few weeks of downpour we get. Oh, and we make a run to Costco for mega lunch supplies. Colored pencils!! I guess the creativity goes all summer too because there are only a couple colored pencils lefts from every box I seem to buy! I signed up for emails and i liked you already on facebook!! a new school year always means new backpacks and new school supplies, our schools take all schools supplies up at the beginning of the year and use them throughout the year so by the end of the year nothing is left for the kids to take home! Toothbrushes! Back to school is a great reminder to change toothbrushes. We also upgraded the insulated drinking cups and food containers this year. The one thing I always buy new are shoes!!! My five year old goes through shoes like crazy! Also a must have are jeans another thing he grows out of quickly. Other then that I try to recycle and re-use what we already have such as markers, pencils, notebooks, etc. You'd be amazed at how much un used paper is being wasted and thrown away at the end of the school year! Every year we buy a new backpack. Not only does my daughter beg for one, as she is very 'style' savy, haha, but it's the only big thing we buy every year that is a tradition and she gets excited about. Otherwise very little is bought so we can reuse some items for at least another school year if possible. Toothbrushes! We always buy toothbrushes. Back to school is a great time to remember to replace your old ones. We also upgrade their insulated drink and food containers this year. I buy new binders. I insist on using mechanical pencils, but pens go dry. hair bands, undies and shoes - covering all the bases, I suppose! Shoes! It's always the shoes! My school boy grows super fast and just destroy shoes! The first day of school is quickly approaching. Is your tot stocked up on supplies and ready to go? We're here to help! We scored some amazing eco-friendly back-to-school supplies and now we're giving $270 worth of swag away to three lucky winners. Each $90 back-to-school prize package includes a monkey Ecozoo backpack from Ecogear, a BPA- and phthalate-free Skip Hop Bento Mealtime Kit, a set of Clementine Art Natural Soy Crayons, and a $25 gift certificate to shop Ethical Ocean's amazing selection of eco-friendly back-to-school supplies and gear. Read on to find out how to win one of the three kits, and in the meantime, you can use promo code 'BackToSchool' to get 10% off your green school supply order from Ethical Ocean through September 13! You'll find everything from recycled pencils and notebooks to Fair Trade soccer balls and waste-free lunch kits - check out our favorites in our list of must-have green school supplies. Selection of eco-friendly school supplies from Ethical Ocean. Kids Konserve waste-free lunch kit available from Ethical Ocean.